When you’re deciding on which roofers to hire, you may want to consider how their qualifications stack up against other contractors. In the roofing industry there are certifications given to roofing companies by the shingle manufacturers if they meet or exceed certain qualifications. These certifications allow the roofers to offer their clients greater benefits. If they don’t have these certifications, then unfortunately their clients are missing out on additional protection and warranties for their roof. We’ve covered how we have certifications with Owens Corning, but in this article we’ll be discussing how we can provide the best of both worlds because we are also CertainTeed ShingleMaster roofers for Lexington and Central Kentucky. Here’s the complete description as defined by CertainTeed. Ready to discuss how we can offer you more? When you’re looking for roofers in Lexington, KY that install CertainTeed shingles you won’t have to look far. All roofing contractors can install this brand, but what they can offer you for choosing this brand of shingle is a different story. Here are some of the reasons why you’ll want your roofer to have a CertainTeed ShingleMaster credential. 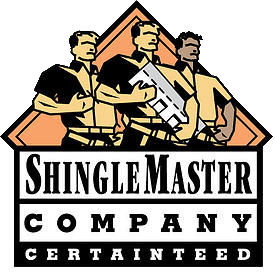 As a ShingleMaster, each roofing company has installers that have a Master Shingle Applicator qualification. This qualification is earned based on parameters that include comprehensive installation techniques as well as knowledge about shingle technology. Another reason of importance is that each certified roofer must conduct their work in a professional manner. There are many qualities that reflect this, but the minimum standards include excellent customer satisfaction and superior workmanship. A ShingleMaster must agree to comply with the most ethical methods of doing business. These include to abide by all required laws as well as be committed to accepted standards of business practices. Each certified roofer must also be properly licensed and insured to maintain this certification. A ShingleMaster is authorized to offer you SureStart PLUS 3-Star and 4-Star extended warranty protection. This additional warranty is only able to be offered because each roofer that has the ShingleMaster credential undergoes extensive training on the most up to date installation techniques for an Integrity Roof System. This additional training ensures that your roofing system will perform at its maximum potential. CertainTeed provides standard warranties for all of their shingles that range between 20 years up to lifetime limited coverage. However, with SureStart protection you’ll additionally be benefited by protecting your roof in the early years after it has been installed. In the event of needing to replace your shingles you’ll have peace of mind that this won’t cost you. 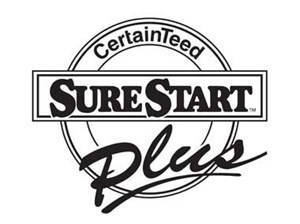 SureStart covers all the replacement or repair costs. Based on the current market value for labor, CertainTeed covers the cost of all labor that’s necessary to repair or replace your roofing system. Because costs associated with doing business tend to increase year after year, your SureStart coverage protects you from having to pay more in the event you need to repair or replace any materials. If you decide to sell your property, you’ll also benefit by being able to transfer your warranty to the next subsequent property owner. This is a value to homeowners who may be on the fence in deciding if they should replace their roof before selling. It gives them a competitive edge in the real estate market by providing appeal to potential home buyers. Less than 3% of roofing contractors nationwide hold the ShingleMaster credential. This credential is not given out easily and therefore requires the roofing company who obtains it to adhere to a higher level of professionalism and quality of workmanship. This professionalism and quality of workmanship is at the forefront of our operations. We take pride in performing our roof installations with an extreme focus on quality that’s backed by an unrivaled attention to our client’s satisfaction. 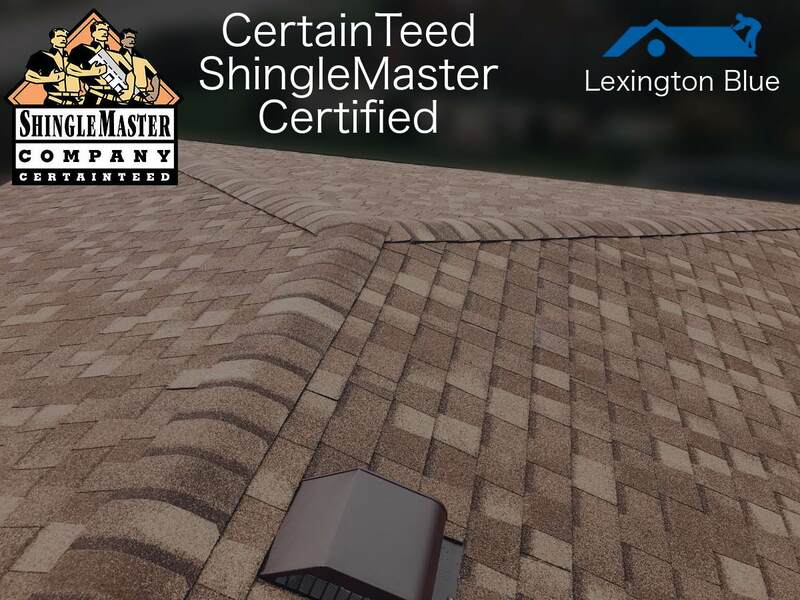 Because Lexington Blue is qualified as Master Shingle Applicators with CertainTeed, we have the knowledge and skill to install your integrity roof system to ensure its maximum performance. This allows your roof to excel under all weather conditions and keeps your warranty fully honored. 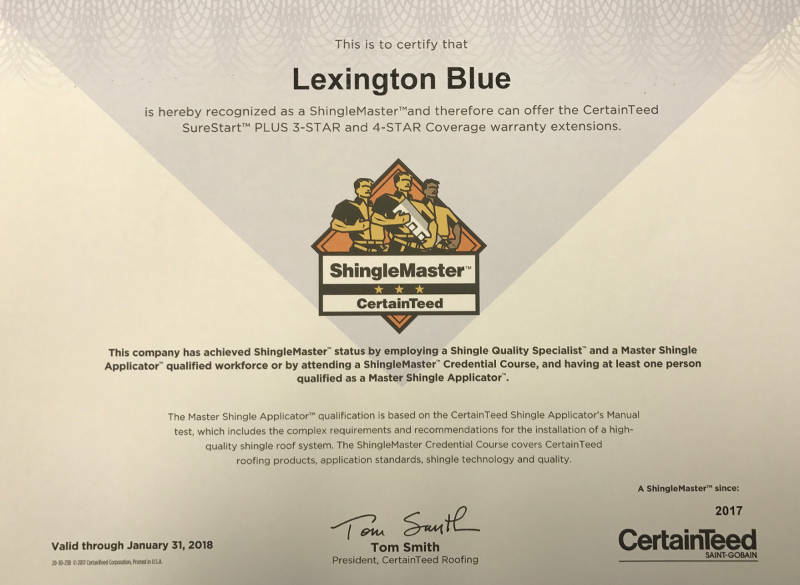 If CertainTeed shingles are your brand of choice, trust Lexington Blue as your certified ShingleMaster to ensure you get the most options that are backed by the best quality workmanship.